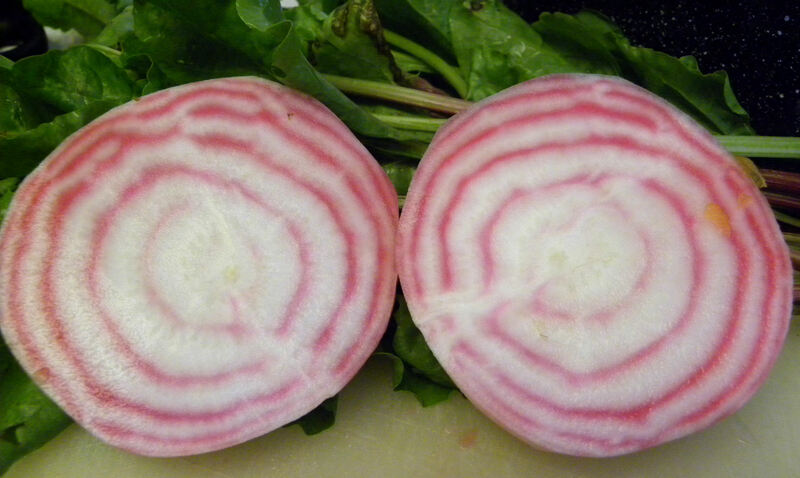 I had a couple of beets pop up in a pathway, volunteers from a Chioggia beet that is now two years old. I’m growing the parent beet for entry in the Orange County Fair’s largest beet competition this year. I have yet to win a blue ribbon in that category, and second place is where my beets usually land. I let two of my Chioggia beets overwinter twice now, and if they’re not the largest ones at the fair this year I’ll eat my hat. They are MONSTERS! But their two offspring are cute little guys and quite edible. I am refurbishing that section of the pathway and one of the beets was the perfect size for harvesting. I pulled them both to make borscht with my last head of red cabbage. There are a zillion ways to make borscht, which is a highly adaptable cabbage and beet soup from Russia. You can leave out the meat for a vegetarian version, or add more beef. I like to use small amounts of meat in my cooking. It’s not quite vegetarian, but it’s better for you and the environment than consuming 8 oz of meat or more per meal. It takes a lot of water to raise meat animals, and it is more energy efficient for us to eat grains than it is to feed grains to meat animals and then eat them. We eat meat about once every six meals, and even then not a lot, so I call us semi-vegetarians. 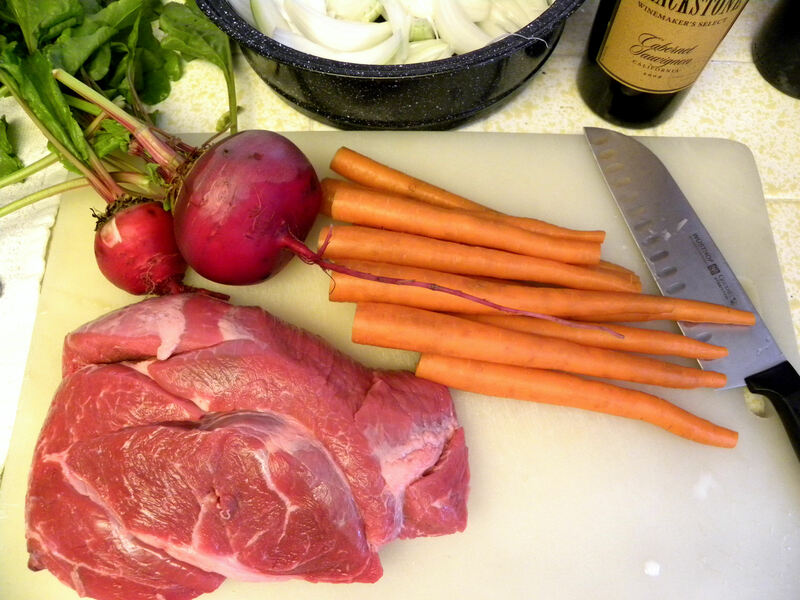 Here’s how I make borscht. I had fewer than three beets and more than six carrots and only enough room left in the solar cookware pan for half a head of cabbage. Doesn’t matter. For this recipe, I used beets, garlic, and bay leaves from my garden. The onion and carrots were from the farmer’s market. I cooked it in the solar oven, but the recipe should work equally well in a crockpot. You may need more liquid if you cook this on the stove. This is a start of making borscht. I took the photo before I had the cabbage ready. Place all ingredients in a pot, adding the liquid last, cover and cook in a preheated solar oven for about 4 hours or until beef is tender. Serve in bowls and top with sour cream. A dark pumpernickel rye bread goes great with borscht. Borscht can be served hot or cold. If you used any of your harvest this week, fresh or preserved, visit Robin at The Gardener of Eden to see how others are using their harvests. This entry was posted in Uncategorized and tagged beets, borscht, cabbage, photos, recipe, Russian, solar oven, soup, Sun Oven. Bookmark the permalink. I have to admit that I have never eaten or made Borscht. I have always been curious about the taste though. I love cabbage and beets…..so, I guess I would love this too! I really have to give it a try. I’m going to copy and paste your recipe. That way I know I will have a good one! Robin, good luck. The sour cream makes this dish as far as I’m concerned.